Shortly before the First World War a highly significant department store was constructed in Goerlitz in the heart of the town. 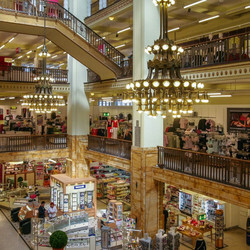 It was considered the most beautiful department store in Germany – a “Lafayette” in East Saxony. The building contains elements of art nouveau style but is categorized as historism style. Recently this gem became the victim of a nationwide company insolvency and has now stood empty for five years, although before its closure it was yielding profits. Every citizen of Goerlitz yearns to be able to go shopping again in this architectural jewel. On the department store’s birthday in 2013 over twenty thousand enthusiastic visitors took the opportunity to see their department store once again from the inside. I purchased the neglected building by contract on the 21st June 2013, in order to revive its glamour. My aim is to provide people on both sides of the River Neisse the opportunity to shop in style (with bilingual service). We will take into account that many people in Goerlitz today still have to live on a small budget. Te general public will therefore be able to obtain products for their daily needs in the Goerlitz store at reasonable prices. Nevertheless, upmarket products and exquisite brands will also be on offer to attract well-of customers from as far away as Dresden, Breslau and Reichenberg. And tourists, who today visit the famous shopping temple in their hundreds every day, should find treasures which will later remind them of their trip to the newly risen Goerlitz. Over the next one and a half years the building will be renovated. Tenants and customers will discover an attractive atmosphere. In the basement there will be a food market; lifts and escalators will be installed and the building will be fully air-conditioned. The granite imitation flooring will be replaced by real stone, and the lateral staircases with their long, colourful art nouveau glass windows will be optically incorporated into the total aspect (taking into account free regulations). The shops and offices will be furnished stylishly in keeping with the architecture of the building and in cooperation with the tenants and the preservation order. On the top floor we are planning a café and a restaurant with a terrace, with a sweeping view right up to the mountains (up until now only a small office profited from the magnificent view). Later an underground parking will be created nearby if possible, so that customers can reach their cars with a loaded shopping trolley, just like in the out-of-town supermarkets. Later, the department store will be open to the public again in the full glory of its earlier years. Some of the shop space will go to frms from Goerlitz and Upper Lusatia as well as to national and international manufacturers and retailers. A quarter will remain in our hands so that we can retain an influence on the goods: setting styles, suitably supplementing the assortment, stocking prestigious brands, and raising the level if necessary. You are warmly invited to participate in this beacon project and to contribute to the upswing in the old and new commercial hub of Goerlitz. Who is the owner of this marvelous building and what is it going to be? 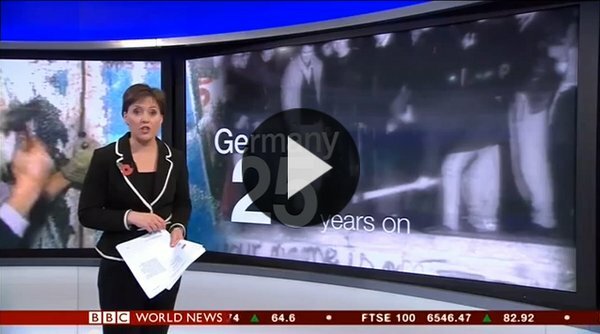 The owner of the store is a real upper-Lusatian! Entrepreneur Prof. Dr. med. Winfried Stöcker is founder and member of the board of directors of EUROIMMUN Medizinische Labordiagnostika AG, an international company from the medical technology branch. The company holds more than five sites in Germany, two of which are located in the Goerlitz region, Upper Lusatia. What is the concept behind the future Goerlitz department store? High quality products, many of them regional, at a reasonable price – this is the philosophy behind the department store. And: a unique shopping experience! We want our customers and visitors to enjoy their stay in the department store and feel almost at home on the 7,000 square metres and find an attractive product range. An interesting mixture of shopping, gastronomy and events will amaze locals and visitors from the neighbouring countries and tourists. Frequent events in the imposing atrium (fashion shows, concerts, balls, literature event…) offer further attractive entertainment. Shop-in-shop or individual stores? What is it going to be? We aspire to a shop-in-shop store with a unified point of sale system and are just tackling this logistic challenge. In the basement, there will be fresh groceries, on the ground floor a perfumery, accessories, special offers and regional products. On levels 1 and 2 there will be a selection of ladies’ and men’s garments. Excellent gastronomy, designer brands and delicatessen will find their place on level 3, as well as a men’s and a children’s world, children’s clothes and toys. On level 4, a restaurant with a terrace is planned which will offer an amazing view of the Giant Mountains. When will the Goerlitz department store be opened? Prof. Stöcker’s goal is to realise an attractive and economically successful department store. To be able to achieve this, it is necessary to extend the former sales floors. We aim to provide state-of-the-art technology and modern comfort for our customers, always taking into consideration the special character of the magnificent old building. We assume that we will obtain the building licence for the project in 2019. Is the department store popular amongst movie makers and fashion show organisers?Absolutely! We receive many enquiries from international and national film and fashion projects. 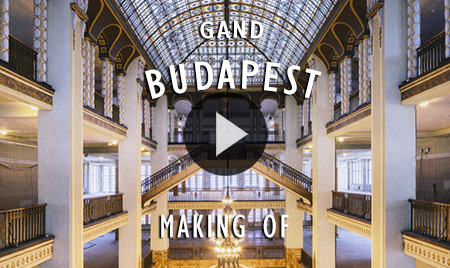 For example, the opening film of the Berlin Film festival, Berlinale 2014, “The Grand Budapest Hotel”, was filmed here from October 2012 to March 2013 and in spring 2014, the spot for the fashion portal “Department 47” was filmed here. For us, this was like a catching a glimpse of the future as this is what the store could look like in some time. Are the gorgeous chandeliers in the light shaft still the original ones? No, the original chandeliers were removed during the times of the GDR. The chandeliers you can see now are facsimile reproductions from 1991. Is the glass roof still in its original state? The beautiful Art Nouveau glass dome which covers the three-level atrium was restored in the 1980es. The special technique which was employed is characterised by the use of enamel colour which is baked into the material at a temperature of 600°C, causing an effect as in a graphic. Will there be escalators in the building? We are currently examining whether and with what visual appearance the comfort of lifts and escalators could be provided whilst leaving the special character of the store untouched. By the way: anyone who feels like walking will not be able to resist walking up the prestigious flights of steps and imposing curved staircase.